بني فندق سيتي تيمبو ميلبورن CBD في 2010، وهو يعتبر ميزة مُضافة للمدينة و خيار ذكي للمسافرين. لا يبعد الفندق كثيراً عن مركز المدينة، فهو يقع على بعد 1 km منها. في حين يستغرق الطريق منها إلى المطار حوالي 40 دقيقة. يقع هذا الفندق الحديث على مسافة قريبة من المعالم السياحية الشهيرة. استمتع بالخدمات الراقية والضيافة التي لا مثيل لها بهذا الفندق في هذه المدينة رائعة الجمال. يقدم العقار واي فاي مجاني في جميع الغرف, أمن على مدار 24 ساعة, خدمة التنظيف يوميًا, خدمة سيارات الأجرة, مرافق مخصصة لذوي الاحتياجات الخاصة لضمان الراحة القصوى لضيوفه. تنعكس أجواء سيتي تيمبو ميلبورن CBD في غرف الضيوف.تلفزيون بشاشة مسطحة, قهوة فورية مجانية, بياضات, مرآة, مناشف هي بعض الميزات الموجود في العديد من الغرف. صممت خدمات الاستجمام في الفندق والتي تتضمن مركز للياقة البدنية, ساونا لمساعدتك على الاسترخاء والراحة. اكتشف مزيجاً ساحراً من الخدمة الاحترافية والخيارات الواسعة من وسائل الراحة والمتعة في سيتي تيمبو ميلبورن CBD. تسجيل الدخول غير ممكن بعد 10:00 مساءً. يُطلب من الضيوف الذين سيصلون خارج الوقت المحدد لتسجيل الدخول تزويدنا بالموعد التقريبي لوصولهم في حقل الطلبات الخاصة عند الحجز. تتوفر خدمة التنظيف في الأيام البديلة مجانًا. يمكن توفير خدمة تنظيف إضافية مقابل رسم إضافي. حد تنزيل Wi-Fi 1 جيجابايت مجاني لكل 24 ساعة. ملحوظة: يمكن شراء بيانات إضافية من 9.95 دولار أسترالي يوميًا. Apartment is located very close to Queen Vitoria Market and within the Free-Tram Zone which was very convenient. I stayed here for 8 days and everything was to great! The gym on level 1 was also clean and moderately equipped with 2 running machines, 1 cycle, multi-function weight machine, etc. The staffs at the receiption were all kind and helpful. I would definately stay here again! Location and hotel was good, but logistically, Agoda and City Tempo kept having some internal processes problem. The booking clearly states it is fully modifiable and cancellable within 3 days prior to arrival, but the Property kept saying they received the booking through Booking.com (not Agoda) and mentioned it was NON-CANCELLABLE. This is provides zero assurance to the customer and I faced much problem and issues just to amend the dates of check-in even though the amendment is done very much in advance. The customer should not be troubled by whatever internal documentation issues between the Property & Agoda, but I found myself spending much time and effort in having to follow-up to ensure my dates can be changed/refunded. Prices aren’t expensive. Central station is near this. Complimentary water wasn’t provided. It seems that it provides a specific guest with complimentary wine. not me. If you want to check in after 10 PM, you notify City tempo in advance. Very nice hotel, well situated for public transport and the markets. Clean and tidy, well equipped for my everyday needs. Great price I would highly recommend. The Skybus shuttle from Southern Cross (which is free once you pay for your ticket from the Airport) first drop off is at the top of ABeckett Street with City tempo on the next corner (Queen/Abeckett) fantastic service. We appreciated the fact that the room we had had a washing machine. The one bedroom suite was small but had everything we needed. Shower room is kind of see through but no problem for us. Good views of Victoria Market and very close by the free tram zone which gets you around the city pretty well. Restaurants and supermarkets nearby so overall it was a good choice. We booked a 3D2N tour in the middle of our stay and they were very accommodating when we asked if we could store our luggage with them while we were gone. 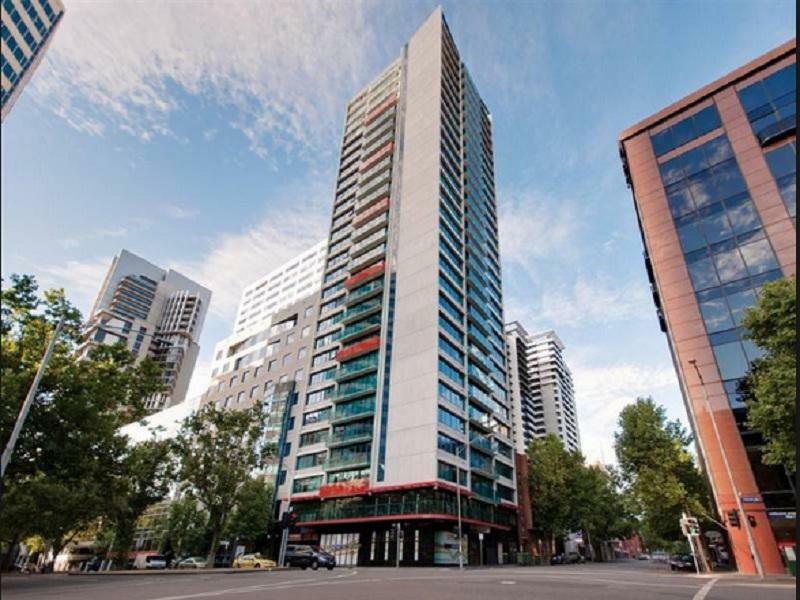 Location is very convenient, being near QV market and a City Circle tram stop. We had a comfortable stay with City Tempo. Will definitely stay there again. The location is good, and about 5mins walk to QVM. Also near to tram station which is free and able to reach tourist spot within free tram zone. Room quite small but equipped with dish washer and cooking utensils. Room comes with washing machine but no drying machine and also no space to dry the clothes. Staff is nice and apologise to us as they did not reserve the room as we required in comment. Overall is ok.
Had a wonderful stay at City Tempo and enjoyed myself a lot! 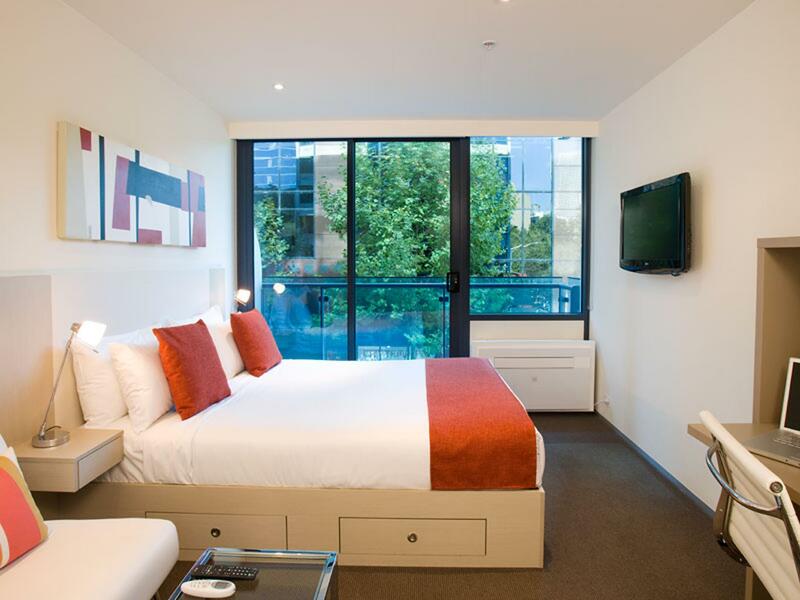 City Tempo has a fantastic location just a stone throw away from the Queen Victoria Market. It is also within walking distance to the city centre and nearby to many dining establishments. Appreciated the full facilities available as well, washing machine, dish washer, cooking facilities were all provided which made for a comfortable and very homely stay. Only drawback would be the lack of wi-fi in room, you will need to go to the lobby for free wi-fi access. The staff members are also extremely helpful, and constantly helped me when I was awaiting the arrival for an urgent parcel. Thumbs up and will return again next time! 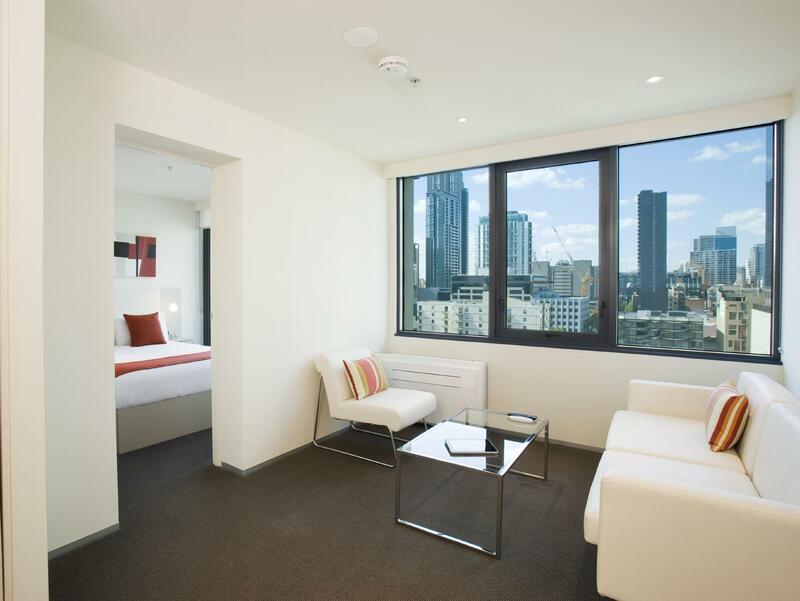 I've stayed with City tempo Melbourne many times and it is clean and convenient for people to go around. The Korean fried chicken downstairs is fantastic. Will recommend to live here for good C/P rate. It was a pleasant stay for both my wife and myself. 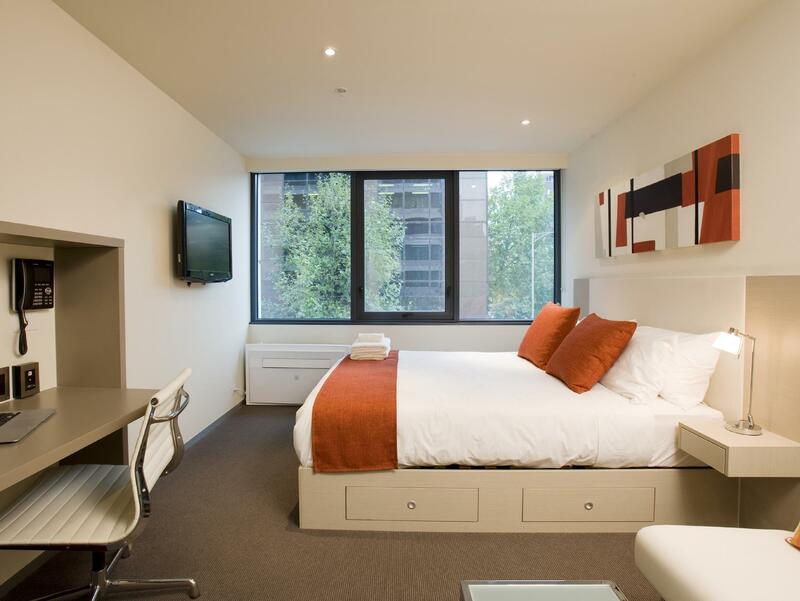 It just situated between Melbourne CBD & Queen Victoria Market. The free city tram is just around the corner within 5 minutes walking only and 15min walk to Italian streets for a nice dinner. Stayed for 7 nights and we just felt very comfortable all throughout. First they upgraded our room from a studio to a one bedroom. Then everything we needed were in the room: dish washer, dining essentials, ironing board, iron, hair blower. The staff were always friendly and helpful. Will definitely book here again. We rented a car and their assigned parking building along La Trobe was very easy to go to. Great as a base location in Melbourne. Queen Victoria market is a few steps away. To access trams, La Trobe St., Bourke St. are all a short walk away. Lovely apartment and great location. It’s a bit on a smaller size but still OK. Love their washing and dryer machine :) However, we think they didn’t do very well with their cleaning. It didn’t look like they paid well attention because the place still looked a little bit messy and unclean. First of all, everything about the apartment was amazing, the location, the facilities, and night night view from our room!!! But, the receptionist’s attitude was super unfriendly! We are travelers from Taiwan. We arrived late at the first night, so we went to reception to finish our check-in process in the next morning. The receptionist who worked at the day was a asian girl whose name was wenjun, she asked us to pay for the deposit, we didn’t understand at first time and asked again, but she answered in impatient way. And I assumed she could understand mandarin, cuz she reacted when my friend and I talked in mandarin. It made me feel it’s kind of racial discrimination. Moreover, she asked us if we need the second key card, my friend and I were discussing and then we said: yes please. She just gave us one key and I said we need the other key. She relied us: that’s what I asked. She pretended to be kind with smile, but the way she talked to us just made us uncomfortable and upset!!!! We didn’t ask any tricky questions, and we didn’t deserve to be treated like this! Staff were very prompt to address our issue and queries. E.g. we did not know how to operate the stove and the reception sent a staff like within minutes to our room to assist. Also, we loved the Nestle choco mix that were provided and tried to ask the reception where we could buy it. Although the receiptionist did know where to buy it, he offered to give us a few packets. It was very nice of him but i did not catch his name. Overall, all staffs are very helpful and friendly. 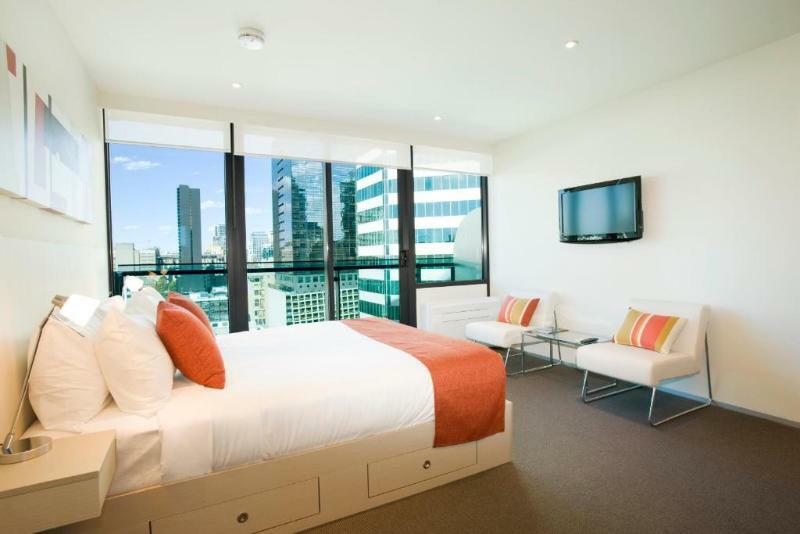 location is walking distance to queen victoria market. there is a convenient store just below the hotel. it is located within free tram zone and it is about 5 mins walking distance to the tram. 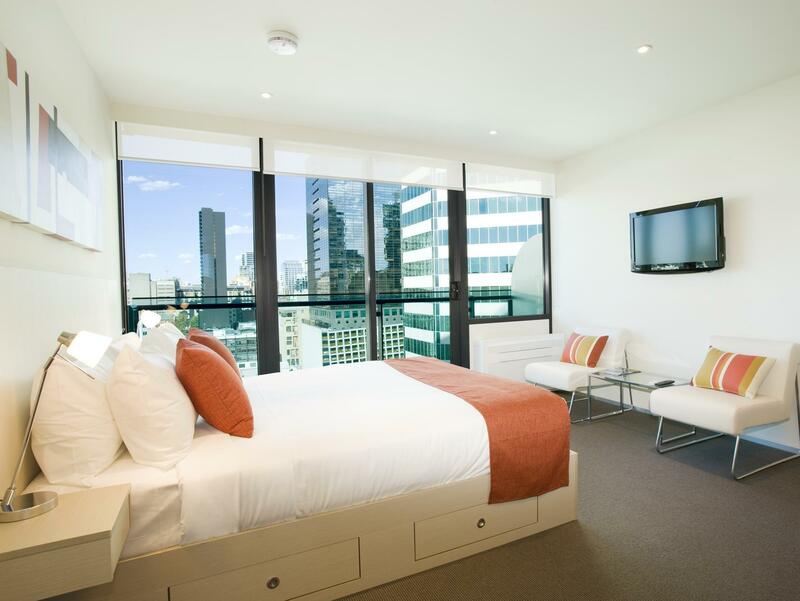 In fact, it is walking distance to shopping area, flinder street, bourke street mall etc.. it is good exercise. the most we walked from flinder to our apartment is about 20 mins or so but there are so many shops and eateries along the route back so it doesnt feel long. However, for my room, the bed area seemed to have a stench that is subtle. Other than that, all is good. I enjoyed my stay and the balcony faces the ferris wheel which is very pretty at night. 5 mins walk to Melbourne shopping district and near queens Victoria market. Within the free tram zone but it is usually faster to walk to places of interest like Federation Square, Melbourne Museum, Botanical Gardens etc. Parking at aud 25/day and need to reserve parking lot early. Everything is great. We had wonderful time staying here. This is about my third time here and I' m still impressed ! 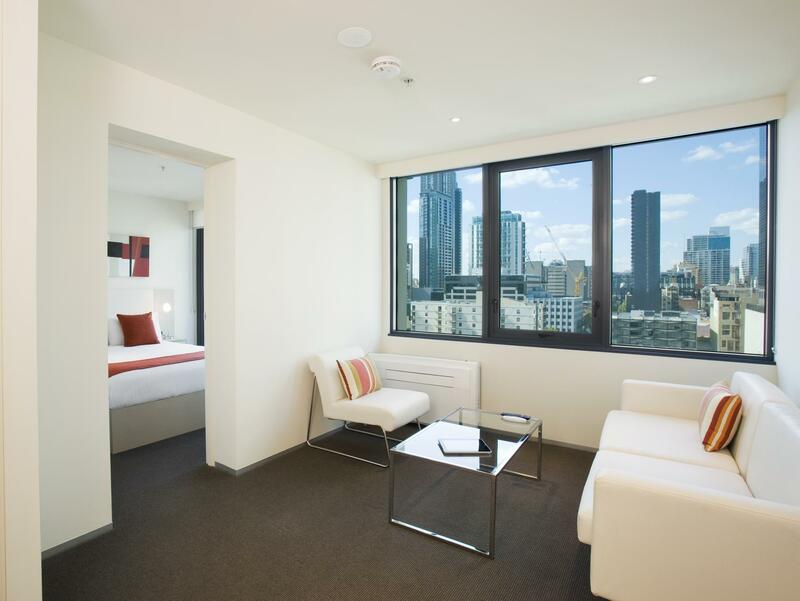 If I go to Melbourne again, this 'll be definitely my first choice to stay :D Thank you all staff and housemaid!! we were allowed to check in early. staff who assisted us with check in was very helpful. We are coming for honeymoon. The hotel staff is excellent and the room is cozy.